We can consider “special” rifles from several different angles. The definition is personal and in the eyes of the beholder, but we’re often thinking somewhat unique, perhaps custom and usually costlier than a standard factory rifle. It doesn’t have to be this way. A hand-me-down with history is special. I have my dad’s 1950s-vintage Model 70 Featherweight. Although the Bishop wood is gorgeous, it has a rollover comb with radical Monte Carlo, almost impossible for me to shoot left-handed (almost all of my rifles are left-hand action or ambidextrous). Add that it’s a .308—a great cartridge, but never a favorite. With such incompatibility and given my inability to hang onto rifles I should keep, now 20 years after Dad’s passing it’s amazing I still have it. But it still groups well, and it’s almost the only rifle Dad hunted with. Most every serious rifle nut must have a .30-30 tucked away. Mine is a ’94 Trapper. Post-’64, it isn’t worth much, but it’s that rare sub-m.o.a. ’94. These are keepers. Some extra-special rifles are expensive, but performance isn’t about cost. You can spend money for good wood, stock fit, embellishment or a special cartridge you’ve always craved, and perhaps the name on the barrel carries renown or prestige. However, today’s factory rifles are so darned good that realizing a premium in accuracy can be elusive. We rifle nuts often define “special” in terms of unusual accuracy. Although names change with time, there have always been gun makers who achieve reputations for exceptional accuracy. Today, thanks to the popularity in longrangeshooting, there are new players in the accuracy game. With better barrels, amazing optics and consistently precise machining once only dreamed of, it isn’t difficult to purchase a rifle that should group very well. Let’s pick a number and say you’ll probably pay a minimum of about$2,500. Depending on the maker, you might pay twice that. If the rifle is stocked in extra-fine walnut to your dimensions and specifications, you might pay twice that again. The frustrating part: Today’s factory rifles from a dozen makers might produce the same level of accuracy right out of the box. Factory rifles are like Forrest Gump’s box of chocolates. You never know what you’re going to get. Accuracy should be adequate, but it could be spectacular. Production rifles are random, but today there are basic bolt actions from Mossberg, Remington, Ruger, Savage, Thompson/Center, Tikka and more that go off a dealer’s shelf for less than $400.Some will be spectacularly accurate, most will be okay, and there will be the odd lemon. So if you wanted a higher assurance of extra-special accuracy, you could pick your maker, pay six to 10 times more and you’ll probably get it. As an alternate plan, figure your budget for an exceptionally accurate rifle, pick your brand and model, and buy six of them. I’d pretty much guarantee at least one will be as accurate as almost any “name” rifle at any price. Keep the best one and put the rest on Gunbroker.com. You’ll get most of your money back. That’s a lot of trouble. I doubt anyone has done it, but if accuracy is the goal, this strategy would work. Then there’s the investment angle. Like we tell our spouses, you can’t lose money on guns. This is generally true of basic rifles if you hang onto them for awhile. It is definitely true of guns with established collector value, although it’s essential to buy smart and never on impulse—like I usually do. However, it is often not true of rifles made, in whatever degree, to your custom specifications. You must find a buyer who shares your tastes. In the case of rifles from “name” makers, you’re also banking on the continued reputation of that maker. It’s difficult to get your money back out of custom rifles. I’m addicted to rifles, and I’m impulsive. When the gun safes are full, I cull the herd. This invariably leads to selling rifles I wish I’d kept—which is all of them. My situation is complicated by being left-handed. Now I’ve cut out 85 percent of potential buyers. 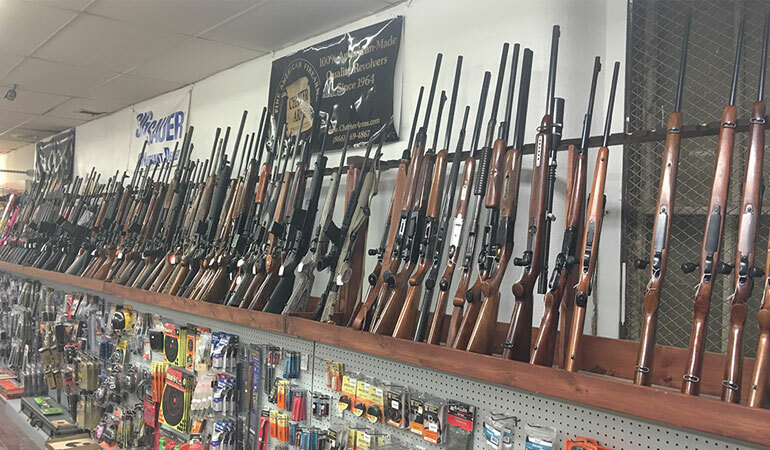 Left-handed rifles are difficult to sell, and rifles in nonstandard or unusual cartridges are almost the kiss of death. As an inveterate gun buyer/trader, I’ve hit some licks, but I’ve also taken some serious baths. That’s part of the game. Now, if I were like some of my colleagues who never let a gun out of their hands and purchase every test rifle that enters their door, there would be an awesome estate sale someday. But that’s not me. The intangible angle, however, is pride of ownership and the satisfaction in using an extra-special rifle, whatever that means to you. I confess to a lack of resistance to left-handed rifles, even with their value limitations. On my first visit to John Wootters’ house, I got him to show me some of his rifles. He had a friend, gun maker Joe Balickie, long a leader in the American Custom Gunmakers Guild. ACGG is members must craft at least some gunstocks by hand, no duplicating machines, hand work in wood only. John had a couple of Balickie rifles I greatly admired. Joe became my friend as well, and I long wanted one of his rifles, but that dream was unrealized before he retired. Not so long ago he called and offered me a .270 made for a client who had passed on. I opened the box of chocolates. Left-hand Carl Gustav action, the only one I’ve ever seen. Pure Balickie woodwork, slim, trim, perfect, awesome checkering, checkered steel trap buttplate with matching pistolgrip cap, magnificent bluing, gorgeous, unblemished, little used and much cared for. The problem with any used custom rifle is it wasn’t really built for you. That ego boost is missing, but invariably such rifles have features you may not have specified. This Balickie rifle has a blind magazine, great for showcasing fine walnut, but I prefer hinged floorplates. On the other hand, it fits me perfectly and handles like a dream. Does it shoot? It came with a, now vintage, 2-7X Leupold, which I suspect will stay on it because its first group was a quarter-inch cluster with Hornady 130-grain GMX. It is thus extra-special. I’m writing this on an Ethiopian jetliner, bound for Namibia. The Balickie rifle is somewhere below me in checked baggage. Other than some groups and a couple of hogs, this is its maiden voyage. It’s a rifle I intend to keep, and I hope I do, but I know I’m going to enjoy using it. And that, ultimately, is what an extra special rifle is all about, regardless of configuration or price.